My Buzz Aldrin autograph is a constant reminder that CAN is always within reach. When I was 10, I told my dad I wanted to be an astronaut. 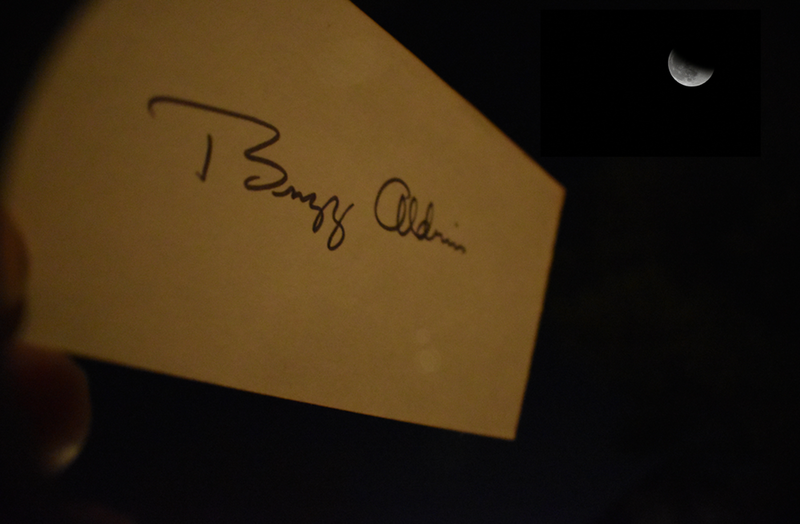 For my birthday a few months later, he gave me a notecard with Buzz Aldrin’s autograph written on it. I marveled at the signature. My dad knew what I needed to hear. He was not going to let my food allergy prevent me from dreaming about being an astronaut if that’s what I wanted to be. How many nights did I spend staring at that little card as it rested on a shelf in my bedroom? Buzz Aldrin. Milk free space food. Liftoff, JJ! Adopting a CAN attitude is vital for our children, and I’m asking the parents and educators and allergists and all adults who read this blog to commit to introducing the young people in your lives to CAN. Let’s empower them. Let’s believe in them. Let’s encourage them. And let's responsibly advocate for them, especially for the young people with allergies who may need an extra boost or two to get to Can. A young person with an allergy may have additional obstacles standing in the way. And, while the obstacles may be obvious to them, a young person with a food allergy, for any number of reasons, may not be able to adequately verbalize what they're really worried about. Full disclosure. When I was in middle school, I didn’t want to join any team sports. The reason? It had nothing to do with actually playing the sport. I was concerned more about the water bottles that the trainers might squeeze into the players’ mouths. I remember watching the NFL one Sunday and seeing players on the sidelines sharing water bottles. I decided then that football wasn’t for me. Think about that just for a second. How many CANs did I exclude simply because of water bottles? A water bottle sidelined my NFL career. And my MLB career. And my NHL career. And I never told my parents why I didn’t want to sign up. I also didn’t sign up for Greek language lessons at our church because a friend told me they had “REALLY FUN PIZZA PARTIES.” I was scared my parents would intervene and ruin their “REALLY FUN PIZZA PARTIES.” I never told my parents that the real reason I didn't want to learn Greek was because I didn't want to ruin someone else's fun. That’s why it’s imperative for all adults to remind children with food allergies that they CAN practice and CAN participate and CAN be just like the others, even if they have an allergy. And if they are concerned about ruining something fun for the other participants that’s already in place, create a safe solution that doesn’t ostracize your children or that doesn't make them feel like they're a burden. Children allergic to dairy CAN successfully play football. Children allergic to peanuts CAN successfully play the trumpet. Children allergic to wheat or soy or shellfish or tree nuts or eggs or whatever allergen CAN successfully code computers and master chess and play volleyball and learn new languages and perform a 360 inward double heelflip on a skateboard and dance and ski and juggle and paint and do whatever they desire their CAN to be. And if they have the skill, the passion, and the resolution to succeed, they CAN even one day touch the moon.